This Federal style mortise lock set is the ideal choice for your early American or colonial revival style home. Small round knobs and rosettes are paired with a wonderful "tassel" keyhole cover, for an authentic period effect. A substantial mortise lock with two large skeleton keys completes the set. Made entirely of solid, unlacquered brass, which may be polished or allowed to develop a natural antique patina. 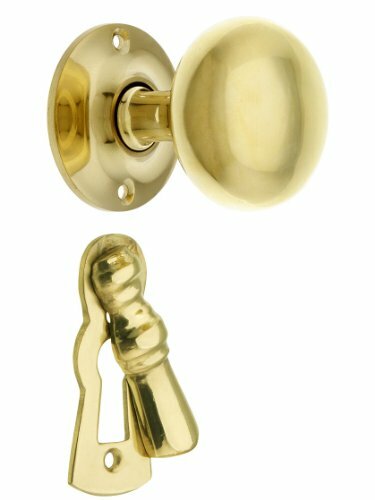 Door set dimensions: Doorknobs measure 1 7/8" in diameter. Rosettes are 1 7/8" in diameter. Tassel keyhole covers are 2 1/2" H x 1 1/8" W.
Mortise lock dimensions: Backset is 2 1/4". Lock case: 3 3/4" H x 2 7/8" W x 11/16" thick. Lock face plate: 6" H x 1" W x 1/8" thick. Strike plate: 4 5/16" H x 1" W.
If you have any questions about this product by House of Antique Hardware, contact us by completing and submitting the form below. If you are looking for a specif part number, please include it with your message.